As a lifelong fan of the JRPG genre, particularly Hironobu Sakaguchi and Nobuo Uematsu’s respective work on the Final Fantasy franchise, I’ve been as excited as anyone for The Last Story, especially in light of this generation’s relative dearth of JRPGs. I got a chance to check the game out for the first time last week, as it’s not yet released in the states, and I was glad to take it. Aside from the high profile names attached to the project, The Last Story’s world and aesthetics are what have sold me on the game thus far. The feel is somewhat reminiscent of Final Fantasy’s Ivalice, which is the setting for some of my favorite games in the series (like XII and Tactics). 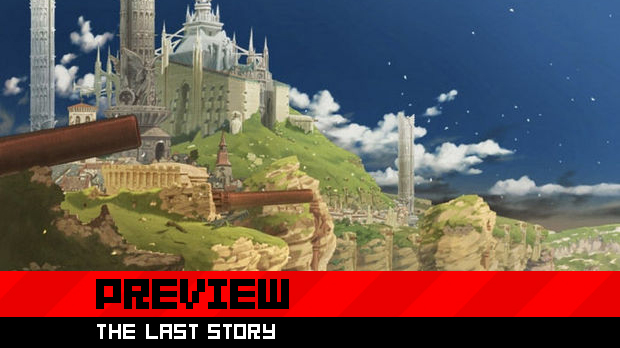 The relatively small portion of The Last Story I went through felt like it might just have the same charm and character I found in the aforementioned titles, while simultaneously experimenting with a bit of an upheaval of JRPG conventions coupled with modern contrivances. I started at the beginning of The Last Story, eventually making it to what is to be the sole hub town. 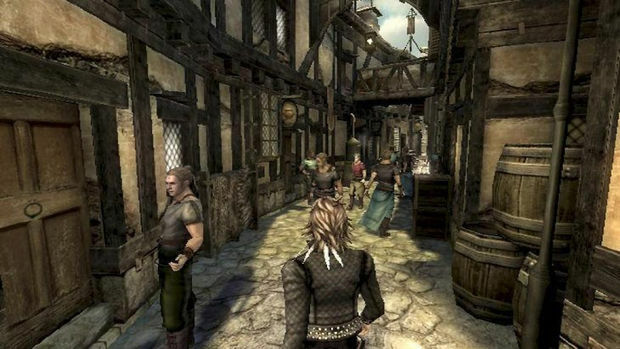 While only having one town to fully explore may seem like a disappointment, the town is huge, dwarfing, for comparison, Final Fantasy XII’s Rabanastre and certain portions of the town are locked off until story or side quest specific events unlock them. 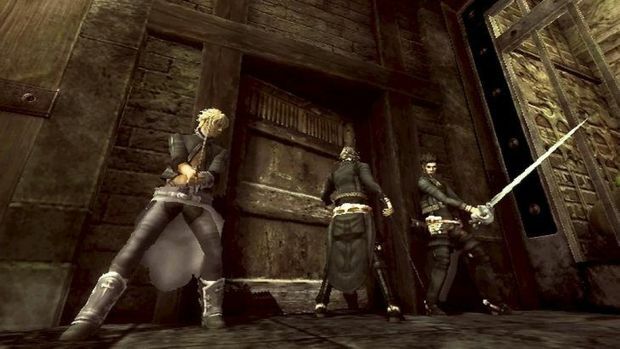 The game opens with a band of four mercenaries -- Zael, Dagran , Syrenne, and Yurick -- probing some abandoned, likely ancient site. This introductory chapter allows you to get more familiarized with the controls, as there’s a surprising amount of things happening at once early on, and offers a nice, explicit tutorial with some lovely 2D art. The default control scheme employs an auto-attack system that requires only you to approach enemies and push your body towards theirs to attack them. Though functional and more elegant looking, I opted to change to manual attack fairly quickly, as the busy, acrobatic nature of combat made direct input feel a bit more comfortable and organic, even though the main character is left a little less fluid and stylish for it (because occasionally I will miss and be slashing at nothing). The opening, introductory chapter is a rather formulaic dispatching of trivial-looking enemies, and a bit drab, given the underground nature of the scene. Soon into it, however, some appropriately interesting story things occur that set the framework for the game and its mechanics. Zael stumbles upon a rather strange, glowy-arm power that lets him attract enemy attention and revive (for a limited number of times per battle) downed party members. The way this power is used to explain some of the mechanics of the game is rather clever, and an important part of the main plot. Once you get the fancy arm power, combat depth increases immediately. While Zael can fight with melee and long range attacks, the newfound abilities make him the sensible party leader. You can issue commands to your party members on the fly and Zael’s special ability, “Gathering,” is incredibly useful to keep your enemies preoccupied, allowing your party time to cast spells or simply allowing them to fight with less resistance and build combo chains. This stood out in the game’s first (quite cool) boss fight against a giant who draws out the swords skewered in his back and throws them at you and your party. Aside from Gathering and its strategic implications, the combat seems standard fare. Zael can also use Focus to zoom in for a better look at things. When zoomed, Zael can use his crossbow, look at an enemy’s weaknesses, and give specific commands to teammates, like telling the magic user to use magic to destroy the supporting platforms underneath far off enemies. 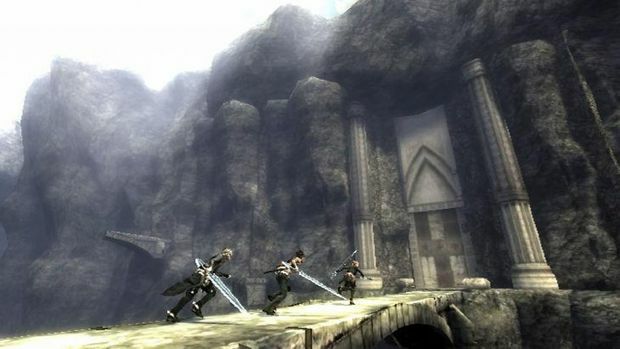 The sword play is acrobatic and exciting, though it’s largely just a matter of pressing A to attack. There’s also a dynamic dive ability, for attack avoidance, as well as a surprising amount of cover. Yes, as in “crouched behind a tiny wall” cover. Not quite sure how I feel about the latter, as it doesn’t seem to fit within the context of the game, but I didn’t suffer in ignoring it and just running around and fighting monsters. On the way back to Lazulis Island, chapter two takes a brief detour when you have to fight a cool-looking white tiger. Once that battle is over with, you can head into the city, and have idle chatter with people along the way, which is why I really began digging the game. Back in town, the party indulges in drinks and other merriment at the bar of the inn they’re staying at and you get your first real glimpse at all of your companions through (optional conversation). Dagran, for example, took Zael in when Zael was a young orphan (Dagran was an orphan, too) and the two got into mercenary work with hopes of eventually being knighted by Lazulis’ Count Arganan. Dagran also wears interesting chaps that show off the inside of his thighs. The dialogue in the tavern was lively and had me chuckling. Syrenne in particular is quite hilarious, as she’s something of an alcoholic and generally a bit insane -- great to talk to. When I finished talking to all the people of questionable sobriety inside and did some shopping in an adjoining room, I decided to go be a man about town and get my first glimpse of Lazulis. It’s really quite a lovely place and I found myself impressed not only by the art design of everything, but even the technical aspects. The Last Story is a gorgeous game. The city was also quite boisterous, boasting all sorts of distractions and points of interest. Occasionally a glint of light will flash over the screen and a quick "Seek" will allow Zael to randomly find items out and about. At one point, I went to a fortune teller and had my fortune read, then saw a bushel of fruit tenuously sitting on a crate. I knocked it over and all passersby, along with myself, proceeded to slip comically. There was just so much to do in the intricately designed Lazulis that I barely whet my appetite for exploration. Thankfully, there’s also an in menu fast travel system between points in the city for when you get tired of running to and from. 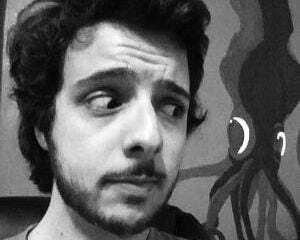 While I still need a lot more time with the game, particularly the combat mechanics, before casting judgment, my brief time with The Last Story has demonstrated the potential for greatness that come along with all of the venerable names involved. I completely love gallivanting around Lazulis, as well as the game’s distinct sense of style and personality. Here’s hoping the end result puts everything together successfully.